This Clovis point was found during the excavation of the Colby mammoth kill site in 1975. It was found within a short distance of a mammoth rib bone. 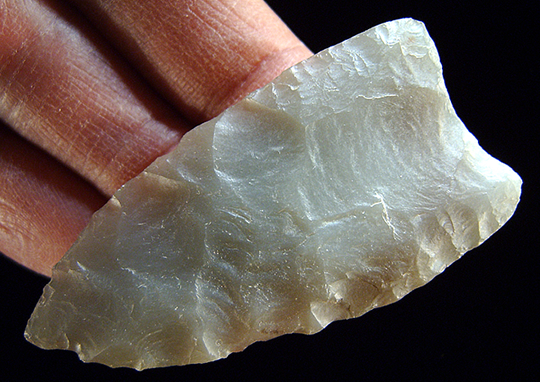 This Clovis point is the only “classic” example found on the Colby site. The other three Clovis points found on the site have rounded corners and deep concave bases that almost look like large notches. This point was resharpened at least one or more times. Evidence of this can be seen on one side in the form of an impact fracture that was partially removed when it was last re-pointed. This Clovis point is made of a dull blue colored semi-translucent Phosphoria chert and measures 2 3/8 inches (6 cm) long. The Colby site is located on private property in north central Wyoming in the Bighorn Basin. This important site was named after Donald Colby who discovered the first Clovis spear point there in 1962. Mr. Colby found it while using heavy earth moving equipment during the construction of a reservoir. The Colby site was first recognized as an important archaeological site when the first scientific excavations began to take place there in 1973. Most of the site was eventually excavated during five separate digging seasons between the years 1973 through 1978. Parts of at least seven mammoths were found in an ancient arroyo (dry gully or stream) in two areas designated as bone pile number 1 and bone pile number 2. There was also a third much smaller bone concentration that consisted of a variety of different mammoth bones. It's believed that due to the difference in the preservation of the bones that the mammoths were probably not all killed at the same time. The two larger bone piles were found to be in direct association with a small collection of Clovis related stone and bone artifacts. New dating estimates for Clovis could place this site as early as 14,000 years ago. Other types of animal bones found on the Colby site include horse, camel, bison, pronghorn, jackrabbit and possibly musk-ox.